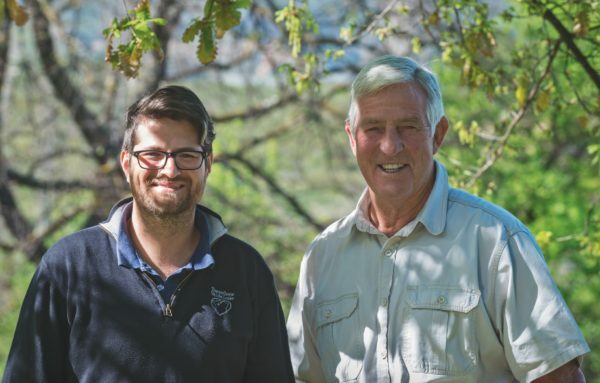 The well-known former Springbok rugby player, foremost winemaker and industry leader, Mr Jan Boland Coetzee, will be among the recipients of honorary doctorates from Stellenbosch University (SU). We take a look back at Emile Joubert’s chat with this legendary icon on his farm Vriesenhof in 2016. Look, I’m all for progress. and having resided and worked in Stellenbosch for almost four decades, I am stunned by the continuous evolution the wine industry has shown, not only in its incomparable wine quality, but also in the imagination and initiative of wine-farm owners who have turned the region into a haven for tourists and other visitors. gourmet restaurants. 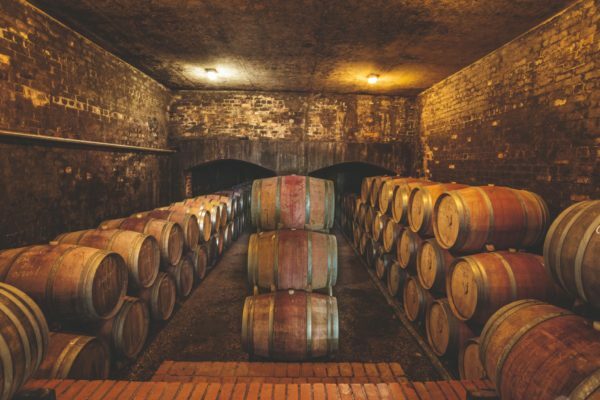 Cavernous, shiny venues that have gorgeous views and offer detailed wine-tastings to rows of eager tour groups. Art collections and play spaces for kids. 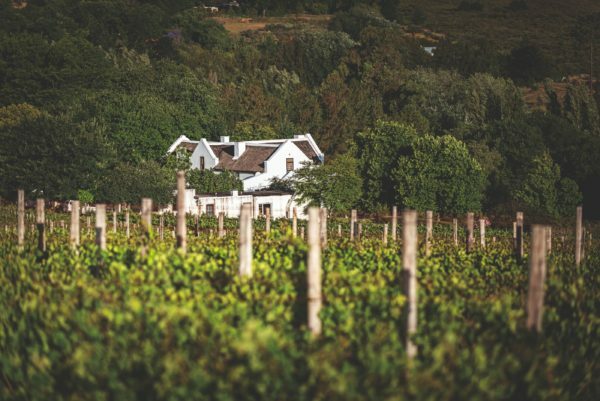 This is all good and over the past 15 years has helped to make Stellenbosch not only South Africa’s leader in overall wine quality, but a premier tourist destination as well. There is, however, always a time and place for wanting to seek out the quieter side. a time to remind oneself of Stellenbosch’s roots as an agricultural community. a place where nature and farmland and the activities of man are in harmony. a reminder of the utter magic of this region. This place is Vriesenhof, set surprisingly close to stellenbosch town centre and opposite the golf course, up against Stellenbosch mountain, which separates the two great wine wards of Simonsberg and Helderberg. 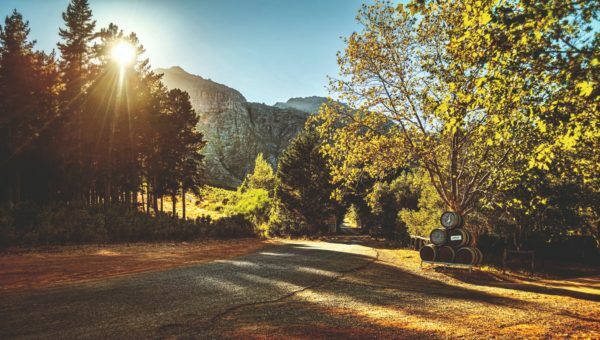 a steepish drive through the quiet Paradyskloof residential area – yes, the road with the lonely oak tree still standing forlornly in its middle – leads to a stretch of open land, and down a slight dip lies Vriesenhof. The feeling is that of a real old farm ‘werf’. a white-plastered building. a walled vegetable garden that looks like it was sketched straight out of the VoC gardening books. The ubiquitous oak trees that spread across the lawns and between the buildings. and I would not say it if security wasn’t good, but the magnificent fig trees of Vriesenhof that stand large, in summer bearing the biggest, sweetest purple figs. Towering over Vriesenhof, the Stellenbosch and Helderberg mountains make an obvious contribution to ensuring there are good views from the farm. But far more than that, they lie at the heart of what this place is all about: wine. At Vriesenhof it is absolutely, first and foremost, about the wine. Wine that aims to express the aspect and soil and climate unique to Vriesenhof. pinot Noir and Chardonnay. pinotage. Cabernet Sauvignon. And those classical components that make up the farm’s Bordeaux-style red blend: namely Merlot, Cabernet Franc and Mal- bec. The sole purpose here is simply to honour the farm’s unique geography by making wines that do justice to this special place on Earth. Okay. Then there is Jan Boland Coetzee. The Don Corleone of Vriesenhof. The Master. The one and only. For those who know this softly spoken and modest man, there is no need to explain that Jan never intended to become the legend in the South African wine industry that he is. Or, as wine aficionado Michael Fridjhon calls him, “a national treasure”. 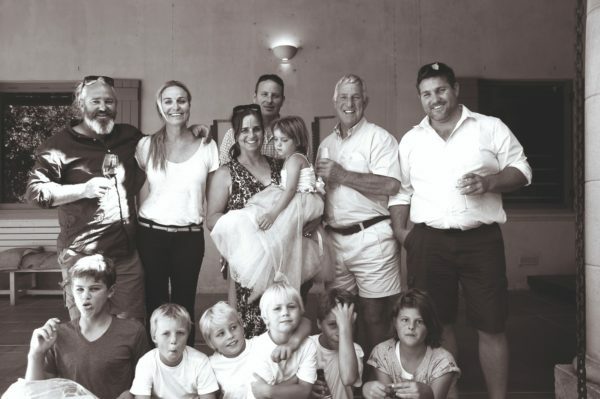 This kind of recognition tends to happen when you celebrate – as Jan did this year – your 50th harvest as a winemaker. 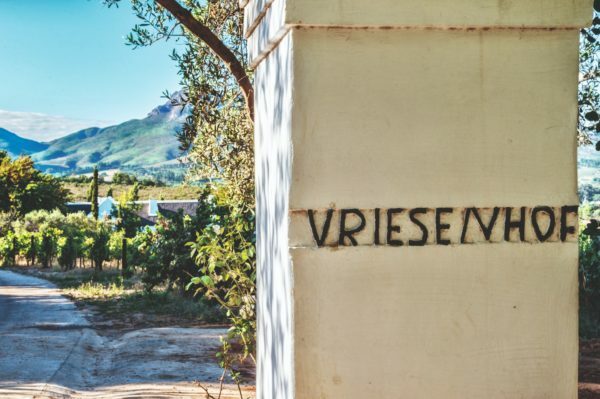 Then there is the pioneering role Jan played, and continues to play, in accentuating the importance of regional and site-specific authenticity to ensure that South African wines bear the unique fingerprint of nature. Jan Boland with winemaker Nicky Claasens, who has taken over from the maestro. Depending on the preference of the wine lover, views on what belongs on Vriesenhof may differ. There is the classic Kallista red Bordeaux blend of Cabernet Sauvignon, Merlot, Cabernet Franc and sometimes Malbec. At times released only six years after vintage, this wine has a cult following among unashamedly old-school Bordeaux purists. Pinotage from the bush vines growing in shale soils on the round koppie provides a beautiful expression, complex and feral and enigmatic. Chardonnay is bright and lean, an ode to the grape’s origins in Burgundy and especially the Beaune region, where Jan spent a year working with the most noble of all white varieties. For me, the Vriesenhof Pinot Noir is the wine that always commands my fullest attention when doing a tasting in the cool room situated on the south side of the Vriesenhof homestead. Like all the grapes he grows, Jan knows the chemistry, composition and personality of Pinot Noir like few others. It is a notoriously fickle grape to cultivate as well as to vinify. I ask him why winemakers refer to this as the heartbreak grape. A wry smile appears. “You know why Pinot breaks my heart?” he replies. “Because I’ve been working with the damn thing for 40 years and I still can’t figure it out.” I and others will tend to differ. But what the hell do we know? I will never forget the first time I experienced Vriesenhof Pinot Noir 2003. The garnet colour was intriguing, giving way to an aroma of sweet flowers, pine-fresh moss and a hint of the box a very good Havana cigar has been stored in. The wine presented itself in a manner that only a great Pinot Noir does: slowly and gracefully commanding the attention of every sense in your body, gently unleashing an array of flavours that made me honestly believe Paul Gauguin was painting in my mouth – exotic, earthy, visceral and fleshy. Mention this vintage and Jan will tell you the day the vines’ buds broke, when the south-easterly started blowing off the sea and how big the bunches were. Just the other day I asked him about the greatness predicted for the 2015 vintage. On the napkin before him Jan began to write: 1974, 1979, 1987, 1995, 2003, 2005, 2013. Under each year he listed the average minimum night and maximum day temperatures for Stellenbosch, then the variation between the temperatures experienced by Simonsberg and Helderberg.